As a boy I grew up in the east end of Glasgow a stone’s throw from Celtic Park. My dad was a lifelong Rangers fan and I guess he expected me to follow suit, but having lost his sight in 1962 when I was three, it kind of ruled out the father/son going to football thing. Looking back, not going to the football didn’t really bother me I preferred playing it and usually had 2 games on a Saturday one in the morning and another in the afternoon. Being from Glasgow I was spoiled for choice Parkhead was close by as was Shawfield home of ‘The Clyde’ with Firhill and Ibrox on the other side of the city. If I was free on a Saturday it came down to who was playing at home, and who my pals and I decided we wanted to go and see. For that and a number of personal reasons I’ve never really supported a club team. I did however love going to watch the National team at Hampden and always looked forward to Scotland home games where I saw the likes of Bremner, Jordan, Dalglish and many others who became household names and Scottish football legends. To be honest I can’t remember when my first Scotland home game was, but reckon it would have been the late 1960’s or early 1970’s when I would have been around 11/12 and allowed to go with my pals. During my teens I was regularly part of the pipe band which played on the park before Scotland home games so had free entry to almost every Scotland game and in 1978 I was part of the band that led the procession around Hampden Park as the Scotland Team were paraded in an open top bus before heading off ‘to win the World Cup’ in Argentina. My first away game was 1979 against the ‘auld enemy’ at Wembley which we lost 3-1 and many years were to pass before my next away games which were Paris in 2002 and 2007. The first game ended in yet another defeat, 5-0 and an embarrassing start to the career of our first foreign manager Bertie Vogts. Things did get better and I’ll never forget that memorable evening of 12 September 2007 in the Parc des Princes where the only goal by James McFadden sealed an absolutely superb 1-0 Scottish win. During this trip I met with a work colleague who was a member of Saltire Tartan Army which he told me met in the Iron Horse, Glasgow on the last Sunday of the month. I was invited to join Saltire, which I subsequently did. This in turn led to me joining the Scotland Supporters Club where I have made some great friends, and as a result now attend games at home and away on a more regular basis. Around 6 years ago I joined WESTA where I met John Daly and through conversations with him learned about the Tartan Army Sunshine Appeal and the work they do donating funds to charities in the countries the Scottish National team play in. I was keen to find out more about this and in March 2013 Scotland had an away World Cup qualifying game against Serbia, which was to be played in the 2nd largest city in Serbia, Novi Sad. I learned that on the day of the game the Tartan Army Sunshine Appeal would be making a donation to SOS Kinderdorf a charity for children who for a variety of reasons had no family, and lived together, in groups of differing ages as a family, in houses within a small village. I was invited to the presentation which received national media coverage and an appearance from the local Minister for Sport. 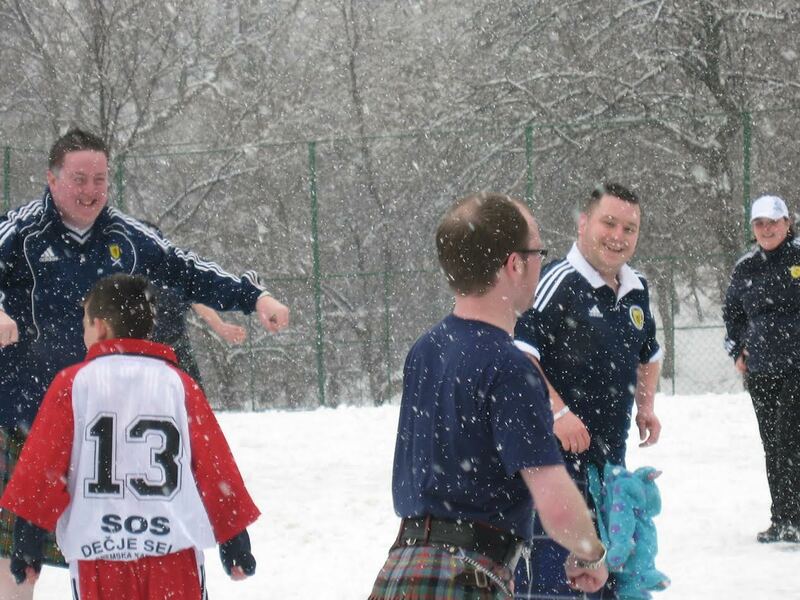 The charity was presented with a cheque for £1500 and we were given a tour of the facility during which the kids from the charity and the Sunshine Appeal took part in a Serbia v Scotland 5 aside game of football on a concrete football/basketball court with around 6-12 inches of snow on top and in blizzard conditions. I think the game was a draw (or at least I think that was what was decided), however seeing the happiness our visit brought to the children and staff and the knowledge that the donation made by the Sunshine Appeal would help make their lives a little bit better was the winner for me. 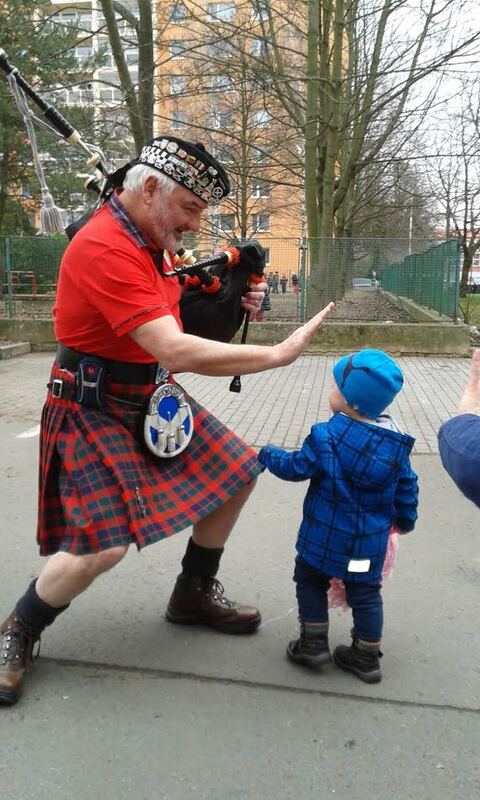 Since that donation in Serbia, I have attended a number of donations and have recently been asked to take my pipes along and entertain the recipient charity with a few tunes during our visit. Each donation is unique and leaves its own lasting memory, however the one that sticks out for me was in March 2014 when Scotland were to play a friendly against Poland at the National Stadium in Warsaw. A visit was arranged by the Sunshine appeal to Fundacja Dziecieca Fantazia, a charity which granted wishes to terminally ill children across Poland. 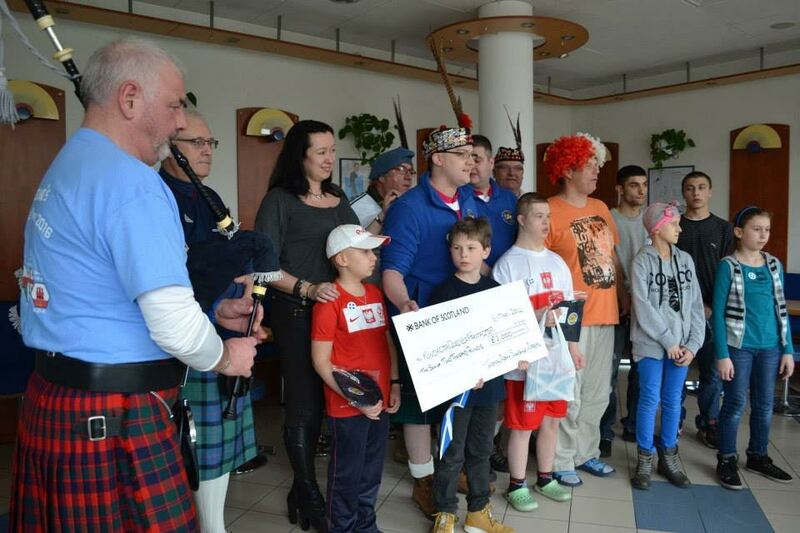 A donation of £2000 was made and it was suggested that we may return to see how the children were doing as Scotland were due back in Warsaw in October 2014 to play a European Championship Qualifier against Poland. The children were aged around 10-12 years old and it was explained by the staff that unfortunately many of the kids we had spent the morning with would not be alive on our return. It kind of put a lot of things into perspective and made me realise just how fragile life can be and that the work done by the Sunshine Appeal raising monies to allow such donations to be made is absolutely superb, especially as it is all done voluntarily. In March 2016 a donation was to be made to the Pink Crocodile, a charity for children with special and complex needs in Prague and whilst travelling to it, I was asked by Neil Forbes (vice chairman) if I would be interested in becoming more actively involved as a position had become available on the Steering Group and he intended to put my name forward for it. I consider it an honour to have had such an invite and having advised Neil that I would be more than happy to be involved his proposal was backed by the other members of the group, and I am now a member of the Tartan Army Sunshine Appeal Steering Group. 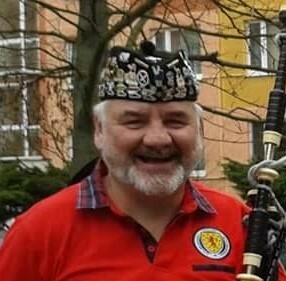 Having recently attended the 60th consecutive donation in Malta and the 61st donation in Slovakia where the presentation was made on the pitch in Trnava at half time, and I played my pipes on the pitch, I hope to be able to attend many more over the coming years, and look forward to being more actively involved in helping raise the funds required to allow the Tartan Army Sunshine Appeal to ‘keep on giving’. If you’ve never experienced a Sunshine Appeal donation it is well worth making the effort to come along and see how the funds raised by the Steering Group are utilised, and experience how they are received by the recipient charity. Most presentations will take no more than an hour of your time however I can guarantee they will leave you with a long lasting memory of your visit.